Looking at Climbing Magazine's website, I noticed an interview with Johnny Dawes, a climber who electrified the British climbing scene in the mid-80s with incredibly bold and technical climbs. Routes such as Gaia or End of the Affair remain standard headpointing testpieces 20+ years later while his 1986 masterpiece, The Indian Face, has seen very few repeats at all. 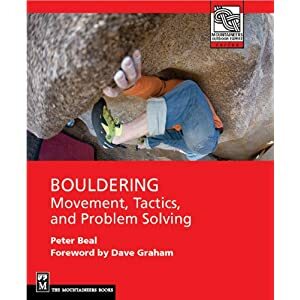 He remains an endearing quirky and intense figure in climbing trying to propose a rethinking of how we approach the sport, encouraging climbers to think beyond the merely physical and approach movement more through intuition. I climbed a few times with Johnny in 1985-6 and admired him a great deal then and still do now. A few years ago I sampled one of his clinics, which if nothing else, refreshed my views on movement and how to solve difficult sequences. However there is a peculiar sense I get in reading the interview, of an individual who is still reliving the intensity of that year 1986,when he climbed so many deadly and complex routes. The obsessional quality required to survive that kind of route can become a goal in itself and it looks like he is right there still. Having climbed with him and sampled the 1980s British gritstone scene extensively I can testify to the lure of commitment on ripples, smears, and minute pebble. The farthest out I ever went was on an E5 5c called Heartless Hare, which has a frictiony insecure 5.10c crux roughly 30 feet off the deck. 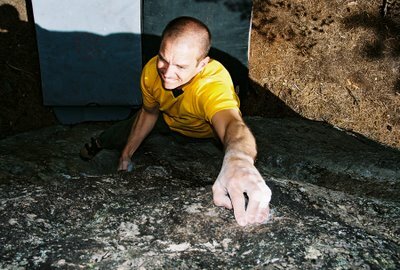 I did several E4 routes as well such as Downhill Racer and a classic E3 arete called Archangel. But more serious and difficult routes such as Ulysses, White Wand, or Edge Lane, let alone Master's Edge or Gaia remained out of reach. The call to cast aside one's reservations and inhibitions and fully commit to a potentially deadly sequence was never fully answered. Do I have regrets from not experiencing that kind of intensity on a route? A few perhaps but I came to realize that the mindset that seeks to explore that dangerous zone can also inhibit a fuller realization of the beauty that climbing provides. In a very real way you must set that aside to survive, set aside everything really and live totally absorbed in the moment. It may prove ultimately a will-o'-the-wisp leading you ever deeper into darkness. Johnny appears to have come out the other side but at 43, my age, seems still to be grappling with that intensity and the abyss that beckons beyond, perhaps looking back like Orpheus at a love that will never return. I can understand in many ways what that's like but the truth is we are always moving beyond a past that has made us and through a present that remakes us and hopefully a future that will introduce us to worlds we still don't know. Climbing is but one of the vehicles for that peculiar road. As usual, good thought-provoking stuff.